French trialist Enzo Reale will not be signing for Hibs. The 25-year-old former Lyon midfielder arrived at East Mains at the start of the week and played the full 90 minutes in Tuesday’s development league match against Ross County on Tuesday. Reale has been without a team since leaving French Ligue 2 club Clermont in the summer and had been open to the idea of putting his career back on track in Edinburgh. 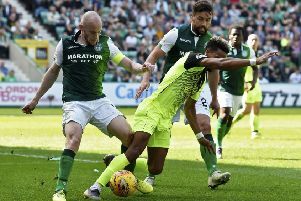 However, Hibs, who are looking for midfield cover for injured duo Fraser Fyvie and John McGinn, had concerns about his readiness to be thrown into the mix immediately. After talks with Easter Road management this afternoon, the former France youth internationalist was invited to return to the club next week so that Neil Lennon could continue running the rule over him. However, with options to go on trial with other European clubs, Reale and his representative Jerome Lancery have decided to look elsewhere for his next career move.